MEXICO IS NOT ONLY CHIAPAS NOR IS THE REBELLION IN CHIAPAS MERELY A MEXICAN AFFAIR. Among the demands of the Mesas (to which the majority agreed) the following ones were included: SalinasÃ† resignation, expulsion of members of the PRI (Patry of Institutional Revolution, the government party) from administrative posts, mobilisation against a possible electoral fraud, political trial of Salinas, electoral reform for the representation of the Indians and all the ethnic groups, recognition of the EZLN as a belligerent force, breaking up the system of National Security, non-assumption of office of any candidates in case of high abstention, expulsion of the army from the states of Chiapas, Guerrero amd Michoacan and satisfaction of the 11 demands of the EZLN. All were almost devoutly accepted by the Mesas. The same atmosphere of confusion, recrimination, vexation and euphoria that prevailed on Saturday evening in San Cristobal with thousands of people bustling in and out of the Mesas and discussing in circles in the streets while songs were heard (and tourists were complaining about the sudden lack of rooms) would prevail even more intensely in the jungle. Around evening Marcos' appearence on stage set off an outburst of chanting: "Marcos, our friend, the people are with you! ", "Transitional Government and a new constitution", "Long live Ramona and Ana Maria" (women Zapatistas), "Long live Self-government by the Indians", "Let the National Convention be an electoral force" but by way of a reply: "All against the electoral farce". Songs about Zapata could be heard as well as the guevarist anthem of the 70Ã†s "Dressed in olive green, politically alive, comrade, you haven't died, we'll take revenge for your death". Marcos announced the presiding committee of the CND and called upon commander Tacho to speak, who declared that the EZLN give Aguascalientes over to the CND. He also presented the people's committees of the EZLN, the civil guards, Indian women, men and children with scarves on their faces and staves in their hands -one of the most touching moments of the Convention. Afterwards, Marcos presented the EZLN army, whose gun-barrels had white bands around them, indicating that "these guns are not to confront the "Civil Society", but paradoxically, they wish to become useless". Marcos' speech, a mixture of sentimentalism, patriotism, poetry and populism was received reverentially and in dead silence by the audience. After exulting at the large CND attendance, Marcos went on: "thanks to the EZLN having mobilized parts of society which had until recently been sunk in apathy and inability to get over their localisms", he made clear that the EZLN, "(do not expect from the CND) a civil arm... a civil pretext for war...or for submission...nor the dubious honour of a historical vanguard, of the numerous vanguards that made us suffer... We expect from the CND the opportunity to search for and find those to whom we will hand over the flag that we found deserted and forgotten in the palaces of power... To struggle so that all Mexicans will recognize it as their own, to become the national flag again, your flag, companeros... We hope that there will be enough maturity at this CND, so that this place will not be converted into a terrain for settling internal accounts, something sterile and emasculated... We are moving aside but we are not leaving. We hope that the horizon will open up so that we will not be necessary anymore, we the dead since always, who have to die again in order to live. We hope that this CND will give us an opportunity, the opportunity we were denied by those who govern this country, to return to our subterranean life with dignity after we have fulfilled our duty. The opportunity to return to silence, to the night out of which we came, to the death we lived in, the opportunity to disappear in the same way we appeared, one morning, without a face, without future. To return to the depths of history, of the dream, of the mountains..."
Amidst a deluge of applause, Marcos left the stage giving the Mexican flag to Rosario Ibarra (president of the CND and the FNCR, National Front Against Repression, a leftist organisation). These moments of patriotic effusions were soon followed by a real storm; a tropical rain storm that swept over everything. Despite the witticisms subverting the original slogans: "Zapata lives, the struggle goes on" becoming, 'Zapata lives, the rain goes on" -and the few brave ones who half-naked were sloshing about in the mud- it meant the sudden end of the first day of the CND in the jungle. The next day after several participants gave speeches that were no more than greetings and a minimal agreement on mobilizations against a possible election fraud was finalized, there followed MarcosÃ† press conference. Confident like a pop star and evasive like a politician, he answered various questions ironically. He expressed again the EZLN's wish for a dignified peace and to make efforts to contact other guerilla armies in the country. To his question if he would take off his mask, Marcos replied, "Yes, if you want it. You tell me". The cries of "NO!" confirmed that the Marcos symbol should remain masked in order to preserve the legend and, in no way, becoming an ordinary, recognizable mortal. Mexican joke referring to the streets one takes to reach Downtown Mexico City. Emanating from the modern industrial-financial bourgeoisie, Madero came to power supported by Villa, his initial admirer, and Zapata. The latter, an uncompromising fighter for agrarian reform, faced with Madero's "betrayal" (i.e. his loyal adherence to his class) called for the continuation of the revolution, issuing in November 1911, his Ayala Plan (4). 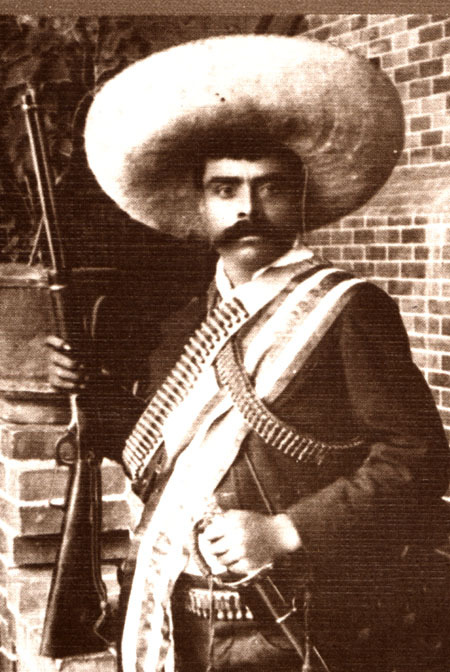 Against General Huerta's dictatorship (1913-14) a loosely united front was formed consisting of three forces: Zapatistas in the south, composed mainly of ejidatarios or landless peasants with a communal social tradition, Villa's army in the north composed chiefly of petite-bourgeois and proletarians and the Constitutionalists who represented the middle-classes, some landlords and even some proletarians and peasants who believed in their socialist propaganda (5). The Convention at Aguascalientes in 1914, where these three armies met, proved the impossibility of their alliance. The outcome of the class war was determined by the alliance made between the powerful workers' union, the Casa del Obrero Mundial (espousing an anarcho-syndicalist and corporate socialist ideology) and the Constitutionalists in exchange for promises of financial support and the satisfaction of some demands of the workers. Among the motives of the workersÃ† class alliance one cannot ignore their discontent with Zapatistas' religiosity and Villistas' brutality, whose increasing militarism had turned them into professional soldiers. When the sound of the last revolutionary guns had died away, the Mexican state faced the double need of its reinforcement and capitalist development. The problem of controlling foreign capital (setting up the Banco de Mexico was the first act of co-operation between Mexican and foreign capital) and the class struggle that constantly intensified in the face of state manipulation, together with the corruption of the official labour leaders and the 1929 crisis, meant things couldnÃ†t wait any longer. The still unfulfilled promises of the Mexican Revolution threatened the legitimacy of the successive governments and the state in general as a vehicle of its ideology. On the whole the state's ability to present itself as a guardian of the ideas of the Mexican Revolution explains the relative political stability of the decades after the "pioneer" CardenasÃ† presidency as well as the recuperation of the social movements. The revolutionary heritage of the peasants and the workers was taught through the state educational system and the state invoked it as its own mother and that's why it assumed the role of its defender (10). When the proletarians did not content themselves with state recognition of their contribution to the making of a "powerful, independent" state and showed vigorously their ingratitude they were turned automatically into "enemies of the Revolution" and "anti-patriots". However, the systematic propaganda of the national-democratic advances gave results: many peasants, workers, petite-bourgeois believed that the big trade unions CTM, CNC and the "popular sector" really represented them.